MapViewTM provides a highly versatile and flexible site mapping capability to visually track and monitor assets within buildings and shop floors. Users can easily associate site maps, blueprints and/or floor plans directly to any location that is IoT-enabled. Zooming out of any map will automatically update MapView™ to the associated parent location map. Likewise, double-clicking on a location icon on the map will automatically expand to the sub-map details (if one has been associated) to any level. This powerful feature allows users to quickly and visually search, locate, and monitor the status of their assets. MapViewTM will automatically map asset movements and inventory by location. Locations can be specified at the shelf, room, floor or building level. You can track and monitor your assets by datacenter racks, warehouse storage bins, retail inventory shelves, toolboxes, and more. Users can easily locate and view conditions through information captured by IoT sensors on the location and health of their assets. Furthermore, users can filter out information to be able to focus on specific assets by site, room or sub-location. 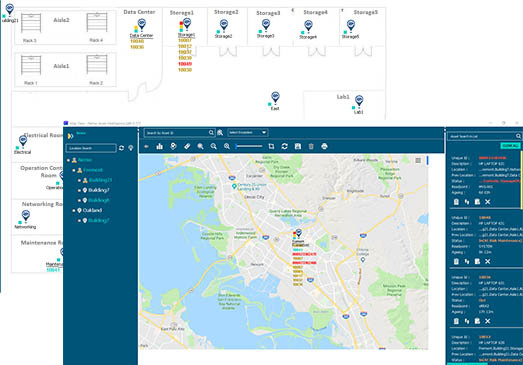 Smart Infrastructures™ can be visually mapped and showcased to validate the benefits of IoT-drven monitoring in your operations.